"This is something you need to know as a teacher," Rebecca Boehler said as she stood in front of a classroom filled with Indiana State University freshmen. While her words referred to filling out field trip paperwork, they also sum up the classes she has taught for the past two semesters as an ISU clinical faculty associate during her year-long sabbatical from teaching second-graders at DeVaney Elementary School in Terre Haute. "I try to plan every class around some aspect of when they will be teachers," Boehler said. During her year of teaching at ISU and attending faculty meetings, Boehler has passed along her knowledge of teaching trends and textbooks as well as challenges and issues from the Indiana Statewide Testing for Educational Progress - Plus exam to different assessments required of teachers. "I've basically been plucked from the classroom so I'm current," Boehler said. As a clinical faculty associate, Boehler shares her knowledge of managing a classroom with the students. She also brings the real world of teaching to the university and passes that along to professors. "We have designed it around the idea of bringing in teachers from the field to help enrich and help reinvigorate our own faculty and bring the current world of teaching into the university," Rebecca Libler, associate dean of the College of Education, said about the position. "They are coming from the clinical experience that we want our students to have as they are learning to be teachers and they are full faculty working alongside our tenured-track faculty. We felt that was a way to enrich everyone's lives." "I wish every teacher could have this position for one year," Boehler said. "This has been a dream job for me. I've learned so much about myself as a teacher, ways that I can improve to be a better teacher, and things that I do that I'm proud of.. 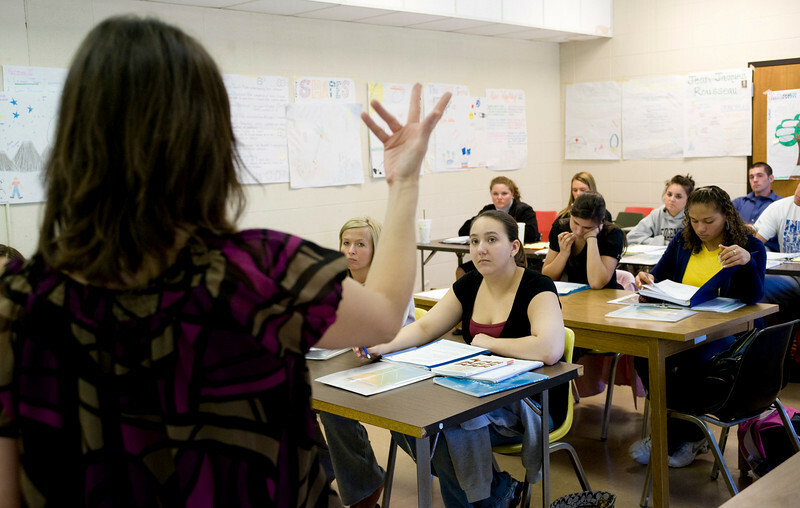 This has been the most growing professional experience of my 13 years of teaching." ISU students said Boehler's teaching has impacted them as well. "She gives you the whole package," said Kaylie Crane, a freshman from Attica. "She is a professor but she also is that teacher who has been in the situations you will be in." "She gives us so many great ideas we can implement when we get our classroom," said Amanda Hofmeister, a freshman from Columbus. "She gives us behavior strategies. She gives us ideas about what you can do with reading to make it fun, what you can do with math to make it exciting, to really just amp up their enthusiasm to learn and really create a good classroom atmosphere for them." As part of the 100-level elementary education introductory course, freshmen spend two days a week for six weeks observing Vigo County School Corporation classrooms, studying how teachers manage their classes and working with small groups of students. "It's an excellent way of getting your feet wet, of just being able to see if teaching's going to be for you because you get the field experience, plus you get knowledge from a teacher, a real teacher that's out there every day with younger kids working with them," said Wesley Clarke, a freshman early education major from Terre Haute. "It's an awesome way to get you fired up about teaching and be prepared and getting a taste to see what everything is like." Hearing about the students' experiences in the Vigo County classrooms impacts Boehler as well. "They're sharing positive experiences of what they're going through," she said. "Today one of the students shared that a fifth-grader thanked him for helping him with his assignment and that gave me chills knowing that my students are going out and really helping the children in the corporation." Libler said College of Education faculty hope introducing freshman students interested in pursuing education degrees to the classroom early in their education will have a positive impact on the students' careers. "We hope that by having early and deep clinical experiences that students will become more accustomed to the classroom and it will confirm their initial desire to be a teacher and will continue to affirm that as they're placed in situations that they have the skills to be successful in," she said. 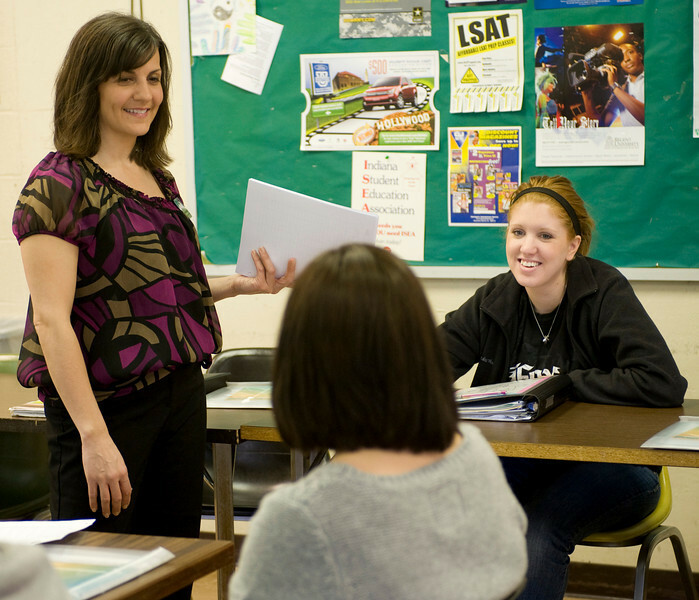 The addition of the clinical faculty associate is part of Indiana State's move toward giving education majors time in real classrooms each year of their education, which culminates in their last two semesters full time in classrooms through the Teachers of Tomorrow Advancing Learning program and then student teaching. "It's a gradual building of teaching skills on the very firm foundation of their content area," Libler said. The clinical faculty associate position and the elementary education (ELED) 100-level class provide the cornerstone of the foundation. "The very first day I told my sections of ELED 100, 'I'm not treating you like eight year olds, I'm showing you and teaching you how to teach eight year olds and so a lot of the strategies and techniques I would use in my second grade class I'm using here,'" Boehler said. That has included using the game Jeopardy to review required reading and giving out and having students give DUCK (Displaying Unconditional Classroom Kindness) awards -- an idea adapted from Sheri Reed at Riley Elementary. She also uses Boehler Bucks, where students earn the fake money for attending class and completing assignments. At the end of the semester students use their bucks in an auction to bid on teacher items. "It's a fun way to keep them motivated and learning," she said. Next fall Boehler will return to her classroom and second-graders. Libler said College of Education officials hope to hire two clinical faculty associates for the 2009-10 year, one to work with elementary and one to work with secondary preservice teachers. "We made it a one-year opportunity because we want the clinical faculty associate to go back into their school feeling like they've gained from the experience as well as we have gained and our students have gained," Libler said. Boehler said she is looking forward to returning to her elementary classroom. "I just feel like I'm rejuvenated this year," she said. "I've got so many new ideas for next year. I have had the opportunity to be in many wonderful classrooms. Plus several of my ELED students have shared many creative ideas with me that I can now use in my classroom." Applications for the 2009-10 clinical faculty associate position are being accepted until May 15. For more information on the position, contact Rebecca Libler at rlibler@indstate.edu or 812-237-2862. Contact: Rebecca Libler, Indiana State University, associate dean of the College of Education, at 812-237-2862 or rlibler@indstate.edu. Rebecca Boehler taught for the past two semesters as an ISU clinical faculty associate during her year-long sabbatical from teaching second-graders at DeVaney Elementary School in Terre Haute.